There are few things in life that I'm incredibly finicky about. Shoes and hair care products make the top of the list. I enjoy trying new products, but it's rare for me to find something worth raving about. Enter Obliphica Seaberry hair care products. They smell nice, but can they live up to my high demands? I want to give you guys some additional background before we dive into individual product reviews. 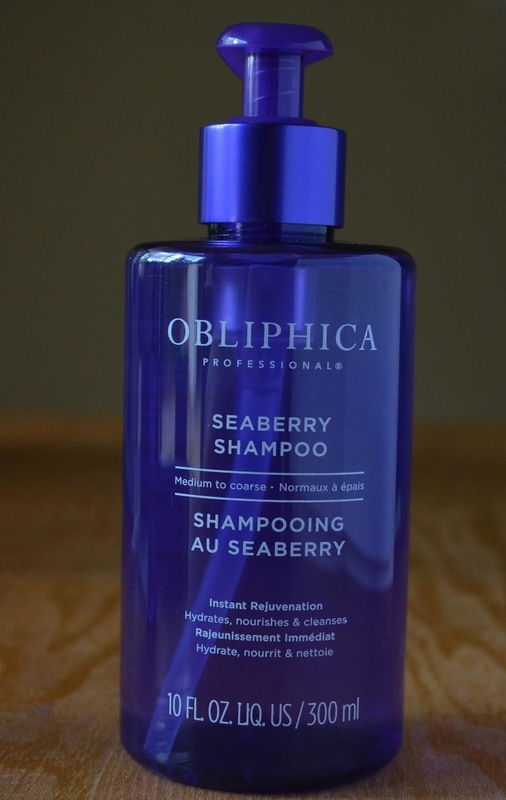 I found it interesting that all of Obliphica's products are formulated around the seaberry. It's a berry that was revered for its healing, rejuvenating, and protective powers by ancient Greek and Tibetan civilizations. You may think that sounds like some mumbo jumbo, but you can't deny the benefits of fatty acids such as omega 3s. If you want to learn more about check out Obliphica Professional's Seaberry Page. The scent is ah-mazing! It kind of reminds me of pink sugar but not as sweet or musky. I'm not sure what it is, but I feel like I want a body wash in the same fragrance. The scent is low-key so you aren't overwhelmed by it. Every once in a while I will catch a faint trace of it in the air. To be honest I almost wish that it was a tiny bit more fragrant. One thing I found unique about the Obliphica Seaberry Shampoo is that it didn't lather up very well. I'm honestly not sure why because it does contain a sulfate, but I did find it surprising. What does this mean overall? You have to work a little harder to get the shampoo through all of your hair. It isn't really a big deal, but I thought it was worth mentioning. Overall I've found the shampoo to be a positive change for my hair. I didn't have a ton of damage to begin with, but I think the shampoo has helped prevent further damage. I've also found that I can go about a day longer between washings because my hair doesn't get as oily. 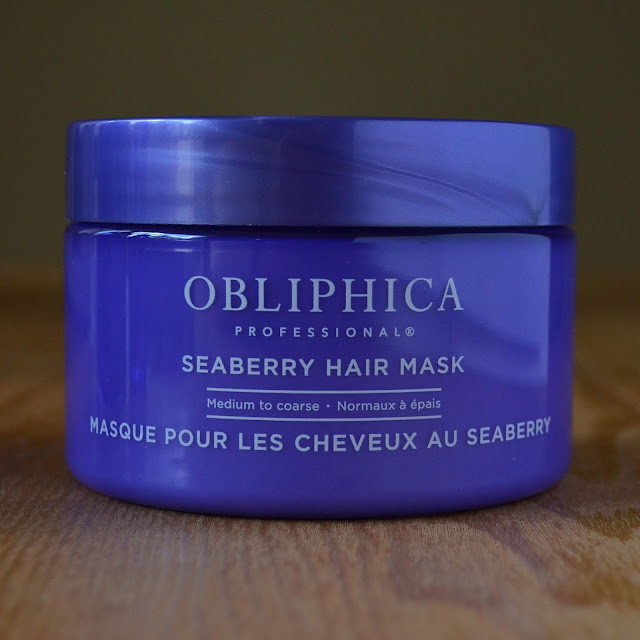 The Obliphica Seaberry Hair Mask has a medium consistency. It's not conditioner runny, but it's also not as thick as some other hair masks I've used in the past. The instructions tell you to leave it on your hair for five minutes before washing it out, so I leave it on when I need to wash my face or shave my legs. My hair gets anywhere from 5-10 minutes of treatment a couple times a week. My hair is a disastrous combination of curly, wavy, and frizzy, so it's incredibly important that I use a product that is moisturizing without being oily. I've found that this mask works great for my hair and doesn't weigh it down at all. I don't know if it's really helped with the frizz fest, but it certainly hasn't made things worse. This little thing of beauty has quickly become my go-to product for those little frizzies that develop mid-day. 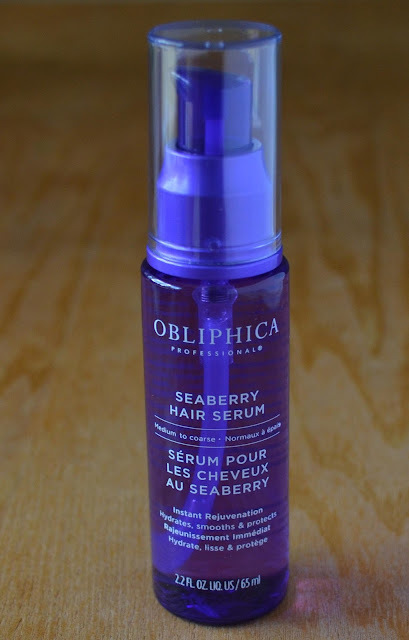 What I like about the Obliphica Seaberry Hair Serum is that it doesn't look heavy or oily on the hair. Sure, you can use too much of it, but if you rub a dime sized amount on your fingertips before applying it goes on quite smoothly. It's also a nice hair refresher if you were missing that delightful scent! I'm not one to purchase mid to high-end haircare products, but Obliphica Professional is my new obsession. I'm going to be so sad when I run out of these wonderful products. If you can fit these in your budget I do recommend trying them. 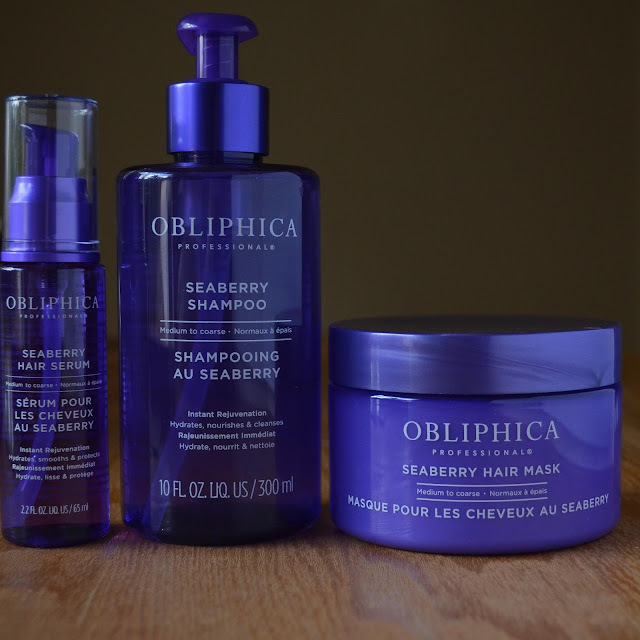 Check out the links below to learn more about Obliphica Professional haircare products.